1 Blemished Available: $299.40 This item is available as a Blem/Refurb. These are items that cannot be sold as "New" merchandise and are limited to stock on hand. See the product details for a description of the product's condition. The Schuberth M1 Helmet is a premium open face helmet that is a product of extensive in-house wind tunnel refinement. The M1 features a drop down inner sun visor and comes with built-in speakers and boom-less microphone ready for the snap-in Bluetooth SRC system. Featuring a breathable seamless ultrasound technology liner, the Schuberth Metropolitan 1 is the perfect combination of lightweight comfort and modern style. People who ride scooters, café racers, naked bikes or touring motorcycles will find in the M1 a perfect companion. Aesthetics, aspiration, confidence, and style united in a helmet. Note: Side pods integrated with visor is sold separately. The Schuberth M1 helmet has a fairly round internal headshape. It works well for riders who need a little extra room from ear to ear, but conversely, it is not well suited for riders who need extra room from front to back. rear air vent vibrates and the noise drives me nuts. I put tape on it and still occasionally use the helmet. Where is the Quality Control ?? I know open face helmets are a little noisier than full face helmets but this one roars. The top vent lets a lot of air flow through the helmet but starts getting loud at only 20 MPH and is terrible at 80, ear plugs are a must with this helmet. They could improve on the soft helmet straps, they do not stay positioned under the locking strap. Not a big deal but you have to screw with them once in awhile. Good helmet but I expected more from Schuberth. Very happy with my helmet and the SRC system as it works very well for the Honda Goldwing (2018). From what I understand it won't work with the other Goldwing years. I've had several phone calls on this helmet. Other person had no idea I was on a motorcycle. I have a C3 Pro and I purchased this helmet in the interest of using it on very hot days. Obviously the M1 provides much more air flow vs. the C3 Pro, but still is very quite inside. The M1 gives up some of the protection provided by the C3 Pro, but in my opinion it is worth it on very hot days. I highly recommend this helmet to "3/4" helmet fans! At 52 mph till 56 mph you hear a whistling - this occurs on all three of my motorcycles with or without windscreens so it's inherent to the helmet - I just speed up or slow down to avoid the whistle. Still my favorite helmet. very impressed with this helmet, it is extremely light and relatively quiet for a open face helmet. No buffeting at 70+ mph and very little engine or wind noise. Airflow thru the top vent is definitely noticeable, but does increase the noise a little. I did install the M1 SRC and love it! i could easily hear my iphone music and phone with the shield up or down. I would definitely recommend this helmet! I i've been riding motorcycles for about four years, and have worn a full face helmet, a modular from scorpion, and now the Shuberth M1 . I've done a couple a long multiple day tours wearing the M1 and I have to say, what a great helmet this is. It was comfortable and hardly knew it was there. One of my pet peeve's about helmets, is their tendency to fog up during the cold riding times. I also commute to work on my bike , daily, and do a lot of joy riding. This helmet does not fog and has a huge top vent to keep the top of your coconut cool. The face shield is made of a hardend poly carbonate material. The reason this is important, is because I went down on my bike on one of those beautiful summer rides, on a blind bend, on a country road. I hit the ground hard and remember seeing the asphalt sliding by my head across the surface of that shield. That was the primary impact point for my head. I suffered cuts, scrapes, and three broken ribs. The Shuberth M1 protected my head. In fact it's got a new policarbonate shield and I still use it. On one trip, that was supposed to provide warm sunshine along the way, turned in to a downpour which I traveled in for about one hour. The M1 kept me dry. Sound quality rivals the full face helmets. It's a great touring helmet, has the indispensable sun visor, and is Bluetooth ready. I own both a Schuberth C3 Pro with the audio system and the new M1 and these are 2 totally different helmets. I got the M1 for the really hot days. I wear an XL on both helmets and I would say that the M1 is not as snug as the C3 Pro but I have a relatively narrow or oval shaped head. The first thing I noticed was the comfort, this is my 3rd open face helmet and I cannot overstate how much more comfortable this helmet is compared to the others. But, to be fair, this is the most expensive open face helmet I've ever bought. My helmet did not come with a pinlock insert like my C3 Pro did, but fogging isn't as big of an issue with an open face helmet anyway. The visibility is awesome. Airflow thru the helmet is better than I expected. I like how Schuberth has the integrated audio system where you only have to plug in the module into the back of the helmet and you're good to go. There is more noise with the M1 as compared to my C3 Pro, but it was expected. My issue with the audio and the noise is that there are times when the road noise overpowers the speakers in the helmet. I added some 3/4" foam under the speakers to bring them closer to my ears and that did help a bit. The microphone that is built into the helmet leaves a bit to be desired. This is an expensive helmet and it stung a little when I bought it but I think it is well worth the money. Personally I think the audio module should be included with the helmet but Schuberth never called me to ask what I think, go figure. The M1 is more comfortable than my C3 Pro and I would rather wear my M1 but I like having some 'real' protection over my face so the M1 will be a hot weather helmet. However if the upcoming C4 fits my head like the M1 I will probably be getting the C4 to replace my C3 Pro... I like the M1 that much. This is my first helmet. I'm claustrophobic and even though I wanted the protection of a full face, I couldn't deal with the confined feeling that comes with it. I tried on the modular, but could only wear it for a few minutes at a time. Came across the M1 and decided to give it a try. I forget that I'm wearing it, it's so comfortable and the vision is amazing. Haven't gotten the Bluetooth for it yet, but it's next on my list. I wanted a premium helmet that was quiet and open faced. Well, it's open faced. A friend recommended Schuberth. The best helmet I've ever owned! Really wanted a cooler/three-quarter helmet and also wanted to see how the Schuberth quality stacked. I wear a C3 for my Concours, but wanted this option for my cruiser. Quality and a comfortable fit. Style, engineering, and company reputation. What else would you want protecting your biggest asset? I have C3 Pro and they are awesome, but in Dubai in the summer I ride with half helmets. Now that Schubert has brought out the M1, I just have to buy them! I have the full face modular model and love it for winter but the ventilation on this model is important during the summer months in Mobile, Al. Have a Schuberth C3 Pro and like it. Reviews I read - and the brand I know is well respected - plus I value my cranium. This helmet is the BEST!!! Great ventilation. Great fit. Built-in speaker and boomless mic are fantastic. The visor interior shade is stunning to look through. So glad i bought this!!!! Full face design and aerodynamics with open face comfort. Snap in Bluetooth accessory. Great reviews. Expectations are high. I have the C3 Pro, reviews for this helmet are good, if it is as good an open face as the C3 Pro is a modular, it'll be a great helmet for me. Read about different helmets for months. Weight, construction and features seemed to be superb. When the helmet arrived and I tried it on I couldn't believe how light it was and how well constructed it is. Also I like the ability to upgrade with comm, visors and the comfort liner. This is the first 3/4 helmet I would consider and that is based on the Schuberth name. Looking for a three quarter helmet with a good quality comm system. Exact helmet I was looking for! I wanted an open face Helmet for around town but I wanted a good one. Fits great and looks cool. I wanted a 3/4 as I have a full beard and find full face helmets to claustrophobic. The Shoei J-Cruise did not fit and according to Revzilla the Arai XC have a similar fit. 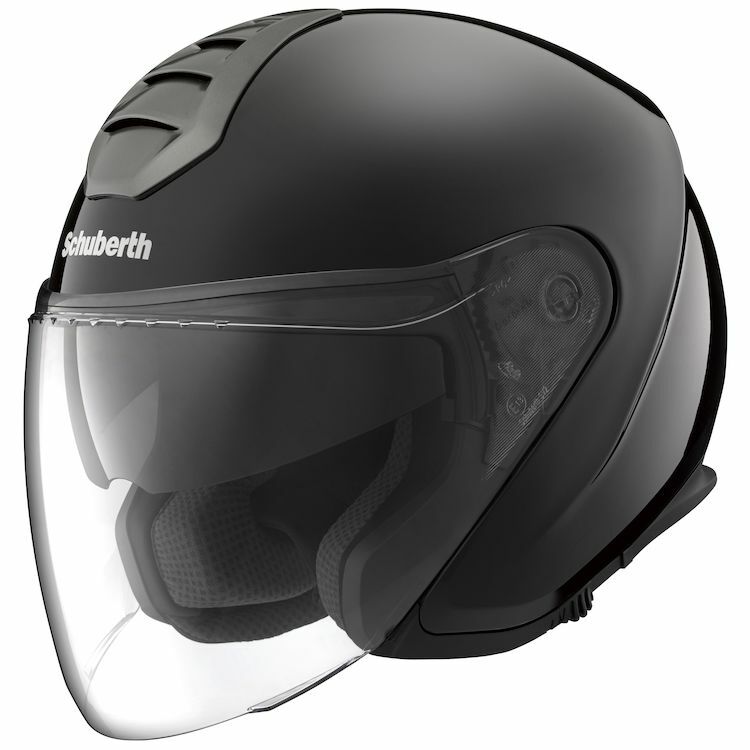 The Schuberth M1 have a round oval fit and I am hoping this helmet will offer the proper fit. I tried this on in a local BMW shop and liked it. I was riding that day with my Schubert Modular. I thought it'd be great to have a helmet with some serious air flow, with a cool color, Paris Blue, and a broad face shield, along with a sun visor. The face shield is replaceable with other colors. There are ear phones and a microphone already built in and waiting for Schuberth's audio system connector (SRC).For music and communication. The more I heard the more I wanted this helmet! Helmet picked for best protection and quality while still having the more open feel of a 3/4 helmet. Also have C3PRO and love it, hope that M1 will match it for quality and comfort. My husband found a full face helmet too stifling in the summer. He purchased this schuberth as a comprise to get more wind but still have protection. He loves it. 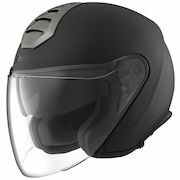 Looking for an open faced helmet for higher visiblity and more airflow during the summer riding. Quality product with a great SRC System! Have the C3 Pro but wanted a helmet to cruise around locally. I chose this helmet because I already have a full face Schuberth. It's the best helmet I've ever had in terms of protection, function, comfort, and style. The 3/4 M1 with large visor gives me better visibility when I want it, and better ventilation on a bike with faring, and large windshield. Bruce Genck - Minneapolis, MN. Can you use goggles with this helmet? Want to use in dusty environment (side-by-side UTV). Would also recomend getting the Lip/visor for when the face shield is not installed, both for looking good, and for not getting dust and/or dirt in the mechanism that holds the big face shield. I cannot see why not. WIll the src work with the sena handle bar accessory ? BEST ANSWER: Mine works through the sound system of my Indian Roadmadter. I have a Shoei Neotec with a Sena System. I plan on giving it to my Girlfriend, and geting a new 3/4 helmet for myself. Will the SRC system pair up with that Sena unit, so that we can communicate? How do the speakers sound? Rockin' out with a bluetooth smartphone would be pretty cool, when the situation fits. BEST ANSWER: I just got my helmet and the comm system that goes with it. It worked great, loud as I want it and clear. Headphone sound is adequate, but tinny and lacking base. System disconnects and shuts down with loud external noise such as from the horn. Also, when used in conjunction with a Garmin Navigator V, the extra step of pushing "hands free" button in necessary. Not much to be done about the speakers, but I imagine the other glitches could be a software fix down the line. The M1 helmet itself is proving itself my go to helmet. Love the field of view. The speakers are amazing. 90mph, earplugs in: can hear every detail. Keep in mind, though, that M1 SRC uses a boomless mic system. Depending on your fairing, height, and other aerodynamics, the mics become unuseable when going over 20-25mph. You can hear anything, but your voice will not get picked up by the mics. Sound is adequate, though a bit tinny and lacking bass. Both general wind turbulence and even opening the top ben do interfere somewhat but not to the point of ruining the experience. It's not as good as an enclosed helmet, but still enjoyable. Helmet to helmet intercom worked well. Much better sound quality that the C3 SRC system. Very good sound quality, and the integrated microphone is a big enhancement. I ought to have spelled "base" as "bass." Would like to edit it. Any idea how it performs in the rain? I've only been in light rain so far and the helmet was fine. The shape of the visor does a good job of shedding water. curious about fogging and rain riding up the inside of the shield? I wear eyeglasses and would like to know how this helmet accommodates eyeglasses. I would appreciate any feedback from those riders with experience in this situation? BEST ANSWER: The helmet accommodates eyeglasses fine. Just put the helmet on first, then the eyeglasses. Take glasses off before removing helmet. A great helmet, by the way. Thanks for your quick response. I would like to try this helmet on locally before I buy one. I live in Phoenix and so far my research for a local dealer has not been productive. Any thoughts? I didn't try the helmet on before purchasing. Seemed to fit perfectly. I also wear eyeglasses and find no problem with this helmet. where would you buy the replacement pads? will the Bluetooth src system connect with other brands of intercom systems such as the Sena brand? BEST ANSWER: Nope. At least I have not been able to connect to Sena. Comfortable fit. Neutral shape in my opinion. No pressure against the forhead. Chin strap is mildly irritating against the adams apple. Minimal use so far, but quite comfortable. Go bigger rather than smaller. If you are on the "cusp" of a XXL or XL, choose the XXL.